A Jury Verdict Research study reports that rotator cuff injuries reached a 7-year high in 2006 with a compensatory award median of $72,667. This is almost 50% higher than previously reported settlements and verdicts in rotator cuff injury cases. Our lawyers have never understood while the national data in these cases was so low. Washington D.C. rotator cuff injuries have averaged well over $100,000 for rotator cuff settlements and verdicts, so we have never understood why the national average was as low as it has been. In any event, for whatever reason, rotator cuff verdicts are on the rise. You have to remember that in this cases you have something of a conflict of interest with yourself. The value of your case increases if you do not have a good outcome. In most rotator cuff case, there is good relief of pain and there is restoration to normal or near normal function. If you are Tom Brady, that’s a problem. But most people will restore a full range of movement, or close to it, and will return to normal strength. If this describes your situation, it is not that you do not have a good case. But the best damage cases are the ones where there is a permanent injury. Another point worth making is that juries (and insurance companies for settlement) want to reward patients who did everything they can to get better. With rotator cuff repairs, it is incumbent upon the patient to do the work that maximizes the chance of a good recovery. If there are degenerative changes or evidence of chronic inflammation in the rotator cuff prior to the crash, the defense lawyer and the medical expert that the insurance company hires is going to try to run with the argument that the accident did not cause the injuries. If your MRI report says there is rotator cuff tendinopathy with a tiny intrasubstance tear, the insurance company lawyers are also going to push the theory that this is chronic repetitive microtrauma on the rotator cuff (that often leads to a tendon injury). This argument carries greater weight with older plaintiffs. Rotator cuff tears are not uncommon as people get older. The other big defense is “How bad can it be if you did not get the surgery?” Rotator cuff repair surgery is certainly not a lifesaving procedure. Many people rightfully fear surgery and kick that can down the road and they are willing to tolerate a malfunction shoulder and even significant disability in terms of range of motion, strength, and endurance. Our attorneys handle rotator cuff injury cases. Our lawyers have handled scores of rotator cuff injuries in car and truck accidents, typically with side collision or “T-bone” accidents. Our lawyers believe that insurance companies do not give fair value in most rotator cuff injury cases and we will fight to get you the financial compensation you deserve. 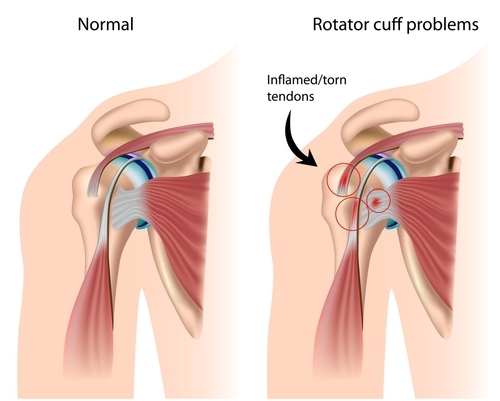 Call a rotator cuff lawyer to protect you at 800-553-8082 or click here for a free consultation and case evaluation.